You know it as well as I do, zucchini recipes are everywhere this time of year. Every blogger in every corner of the world is trying to come up with something different and unusual that you’ve never seen before. 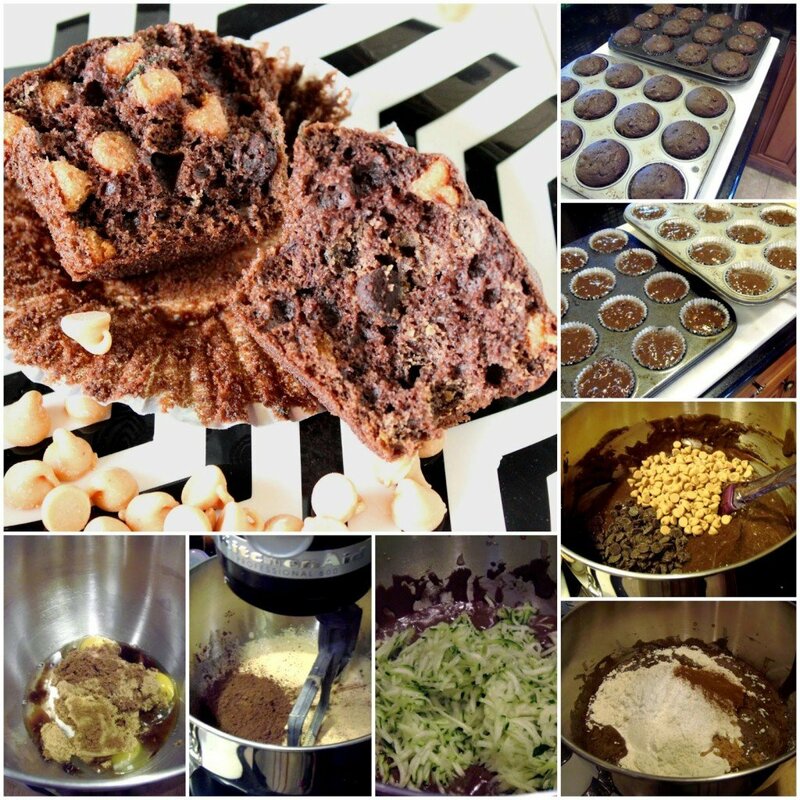 Now, I’m not saying that my recipe for Chocolate and Peanut Butter Zucchini Muffins are all that different, or unique, but what I am saying is that they are delicious and I hope you’ll decide to try them. 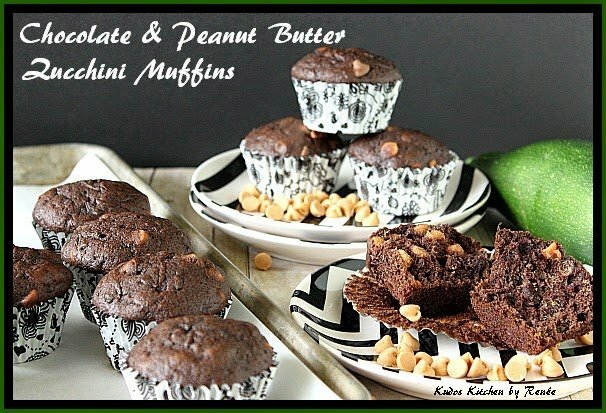 These muffins are very moist and tender and they have the wonderful, rich taste of chocolate and peanut butter that I think is just about everyone’s favorite flavor combination. They’re sweet, but not overly sweet making them perfect for breakfast, a lunchbox treat or after school snack for the kids. Plus, the zucchini is virtually invisible and tasteless so they’re an excellent way to get your kids to eat their veggies without them even knowing they’re having something healthy! They also freeze exceptionally well, so eat a few now and stash a few in the freezer to enjoy when fresh garden zucchini is a distant memory…and as we all know, that happens a lot sooner than anybody ever hopes for. -In a large bowl with a hand mixer or in the bowl of a stand mixer, beat the eggs, granulated and brown sugars until light and fluffy. -Beat in the oil, cocoa, vanilla and zucchini. -On low speed, beat in the flour, baking soda, baking powder, salt and cinnamon until just combined. -Switch to a wooden spoon and stir in the chocolate and peanut butter chips. -Line 2 muffin tins with cupcake liners and spoon the batter into each tin, filling until almost full. -Bake in a preheated oven for 25-30 minutes or until a toothpick inserted in the center comes out clean. -Remove from the oven and cool on a wire rack. Speaking of back to school…these are some fun teacher items I painted a few years ago that can be used for any multitude of things that teachers like to keep on their desks. As always, items can be personalized to fit your needs and requests. Also, I’d love to hear if you’d be interested in learning to make something like this for yourself. If so, I’ll be happy to do a blog tutorial for you, so please make sure to leave me your thoughts and comments in the comment section at the end of this post. Thank you! Now THIS is how I want to eat my zucchini from now on. YUM!! 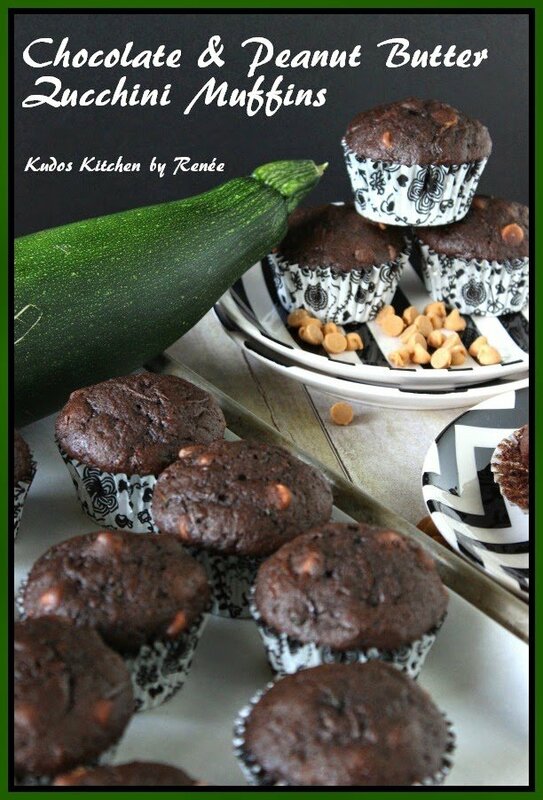 I always need more recipes to use up zucchini, and I especially love the ones that include chocolate! I love that you can freeze thesee too! You made these glasses? They look super cute!! 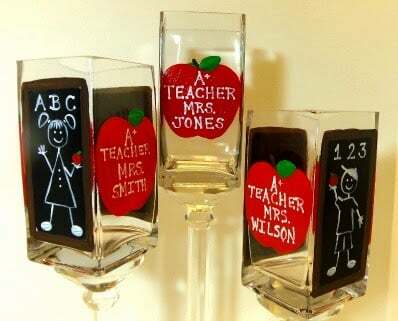 I'm not a teacher but I'd love one!! Wow! My brother is looking at these drooling! Yes!! This is probably the only way I can get my kids to eat zucchini. I need to try these. I must be the only food blogger left who doesn't have a zucchini recipe on her blog. And yes, please provide a tutorial on painting items! Love the *teacher's glasses* and these muffins look absolutely scrumptious!